Nyiragongo summit shelters are found on top of Nyiragongo a beautiful strato volcano that features the world’s largest lava lake. Nyiragongo’s summit rim is largely devoid of vegetation and is frequently dusted with snow. From the rim, visitors can peer down into a churning lava lake and see and hear hot gases exploding up though a mosaic of molten lava. Although predictable and therefore safe for tourists, Nyiragongo is greatly feared during eruptions. Because of the high silica content of its lava, Nyiragongo’s lava flows are extremely fluid. During the 2002 eruption, some of Nyiragongo’s lava flows were clocked at 100 km/hr. and reached all the way to Lake Kivu. Treks to the summit of Nyiragongo volcano begin at the Kibati patrol post, which is approximately 30 minutes by car from Goma. The patrol post is less than a one-hour drive from the Mikeno Lodge in Rumangabo. Park rangers lead all treks and porters are available for hire. The time required to reach the summit depends on the average fitness of each group, but typically takes 6 – 7 hours. Proper hydration is the best way to adapt to the change in altitude. People prone to Acute Mountain Sickness (AMS) should speak to their physicians about taking preventative measures before making the climb. It is possible for fitter people to climb up and descend in one day, but most groups choose to overnight in basic accommodation available at the top (included in the permit fee). Trekkers are advised to bring raincoats and cold weather gear. Rain showers are a common occurrence on the climb up during the rainy season and temperatures at the summit can dip below 0°C/32°F. Guests staying at the Mikeno lodge can arrange packed meal service for the trip, while those coming with tour groups must supply their own. There is no food service on Nyiragongo. Porters can be hired at the base of the climb to carry loads for $12/day ($24 for the overnight trip). The maximum weight that porters are authorized to carry is 15kg. Each of the twelve summit shelters contains two single beds on which visitors can put their sleeping bags. Although these shelters aren’t plush, they offer a welcome escape from the elements. The cost of staying in a summit shelter is included in the permit fee. All prices include permit, accommodation in the summit huts, and 16% Gov’t VAT. Experience Virunga’s newest offering Kibumba Tented Camp an excellent choice for those seeking a more affordable way to experience the mountain gorilla tours in Congo, in Virunga National Park. The camp is conveniently located near the trail head for Nyiragongo volcano, which makes it the perfect place to stay for those wanting to experience both gorillas and the world’s largest lava lake. Guests can also enjoy nature hikes just outside camp or walk down to the local Kibumba marketplace for a vibrant cultural experience. Kibumba Tented Camp features all the necessities of a classic tented camp: great food, full bar, well-appointed tents with comfortable beds, and en-suite bathrooms with hot showers. Orchids Safari Club offers the finest gorilla watching in Central Africa from its base on the banks of Lake Kivu near the Kahuzi – Biega National Park in the Democratic Republic of Congo. Built on the banks of Lake Kivu, the Orchids Safari Club is a waterside haven that is situated near the Kahuzi – Biega National Park. Part of the Congo Democratic Republic (that was formerly Zaire), this central African hotel has views of water on one side and the animal kingdom on the other, depending which window you are gazing out of. The luxurious nature around Lake Kivu enables us to welcome you in an exceptional environment. This sleek and elegantly decorated hotel offers a mixture of contemporary and traditional African styles. An hour from Bukavu, along Lake Kivu, you can discover Kahuzi Biega National Park. This park is one of the last nature reserves to home gorillas. Looking out of the window of Orchids’ Safari Club waterside hotel offers something different, depending on the time of day. Glimpsing the animals at the watering hole of Lake Kivu will make you feel like an intruder in a local pub where the animals gather to rehydrate. Another window offers views of the tranquil lake that shimmers in the moonlight or the hazy view of the gorillas in the mist. 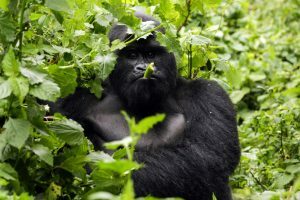 This area offers the finest gorilla watching in Central Africa and this amazing opportunity has inspired creativity with the writing of book and movie called “Gorillas in the Mist”. This hotel caters for people staying in 22 rooms that start from US$90, but the view is free. The hotel is open all year round with a restaurant that has various menus to cater for guests who gather to eat in the dining room. The Coco Lodge is an inn in the heart of Africa, located in the city of Bukavu in the east of Democratic Republic of Congo, a city with exceptional charm; this hostel attracts a national and international clientele. With a private and secure parking, Qualified and friendly staff will be at your disposal. The Coco Lodge has 8 luxurious rooms with double, beds, decorated, according to the theme of Africa. All are equipped with bathrooms or showers, toilets and televisions. The wireless internet network is available everywhere indoors, on the terrace and in the restaurant. All screens have HD and cable, two lounges with bar and fireplaces in addition to a VIP lounge, private bar for guests.